Ever since the Kamjove, I've been drinking more serious tea at work than at home. 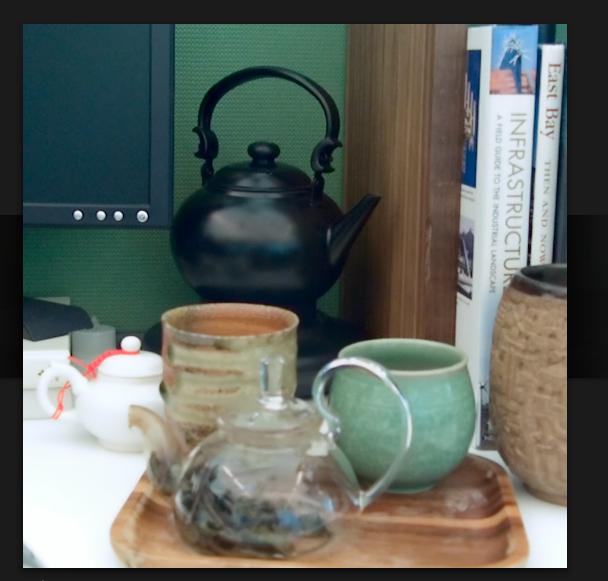 I can just rinse into a large mug and I can happily drink almost any tea I like at my very own desk. Why didn't I ever think of this before? Who knew an investment of $35 could change my work day around. I've been able to even host tea guests. I've brewed Jakub's 2010 Yiwu Purple in the picture below. Sadly, the allergy season has started early in the Bay Area this year and I can't taste much today at all. There are many enemies to tea enjoyment. The above shot was taken with a Lytro. For those of you who don't remember the hype from last year, the Lytro is a revolutionary camera that let's you focus the end photo after you've snapped a picture since the Lytro captures the entire light field. I was hot to procure one of these gadgets except my husband firmly put his foot down. I was lucky that a coworker lent me his. You extract your images all in post processing on your PC. But sadly the Lytro application so taxed my poor laptop that I just took a screenshot and rebooted. It's too late at night so I have to use a more powerful machine this weekend to play with macro tea shots. You can see the long rectangular shaped Lytro above. I'm glad I saved my money. Cool - thanks for the Lytro explanation!